This is a follow-up to a guest-blog on climategate, media volume and public concern. As last time, this blog was written by Alan Valdez (The Open University) in collaboration with Brigitte Nerlich (University of Nottingham) and Nelya Koteyko (University of Leicester). It is linked to research on climate change discourses funded by the ESRC and the Making Science Public research programme funded by the Leverhulme Trust. This blog identifies and analyses climate change related phrases sought by the public on the internet, using data derived from Google Insight and focusing on phrases containing ‘carbon’ and ‘energy’ as markers of public interest. Unlike investigations that use the information providing potential of the internet to examine how concern for climate change is generated by the media (supply-based research), it exploits the internet’s participative potential in order to study information seeking behaviour (demand-based research). The blog builds on previous findings about the use of so-called ‘carbon compounds’, that is, lexical combinations of the noun carbon with other nouns or adjectives, from carbon awareness to carbon zealots, which have become pervasive in the English language. In particular, it exploits results achieved through a cybermetric study of RSS feeds, which identified 34 metaphoric (creative) carbon compounds that became salient on the internet during the months surrounding the peak of public interest in the carbon debate throughout 2007, namely carbon accounting, addiction, allowance, bigfoot, budget, burden, challenge, crazy, credit, critics, crusade, deal, debit, delusion, detox, dictatorship, diet, footprint, future, friendly, guilt, hero, indulgence, lifestyle, living, management, market, morality, payment, saving, sinner and spewing. In order to fine-tune our comparative analysis further, we translated our set of carbon compounds into energy compounds. As we know that “carbon footprint” is a popular metaphor, we surmised that “energy footprint” might be one, too. The translation worked seamlessly for all but one of the compounds (energy spewing). This choice of translating the carbon compounds for their energy counterparts was motivated by the apparent focus on energy concerns within the climate change agenda in the US as suggested by various recent clean energy or climate energy bills. For instance, critics have recently accused American President Barack Obama of no longer using the contested term climate change and replacing it instead by clean energy. Because of this, a cross-comparison of the relative popularity of energy- and carbon- compounds in the UK and US was in order. After pooling carbon compounds and energy compounds, and identifying those that are more popular, the results seem to show an emerging discourse more concerned with energy than with carbon on both sides of the pond, particularly in the US. Upon ranking the popularity of the compounds in the combined carbon/energy list, Carbon footprint was the only carbon compound remaining in the top five for both countries, reaching the number 2 spot for the UK and the fifth in the US. Even though interest in energy seems to surpass interest in carbon on both countries, side-by-side comparison of interest in carbon and energy compounds exhibited a clearly discernible trend: For most compound pairs in the UK interest in the carbon and the energy version tend to become closely matched, suggesting that carbon and energy are seen as two sides of a coin. By contrast, for most compound pairs in the US the lines remain separate. 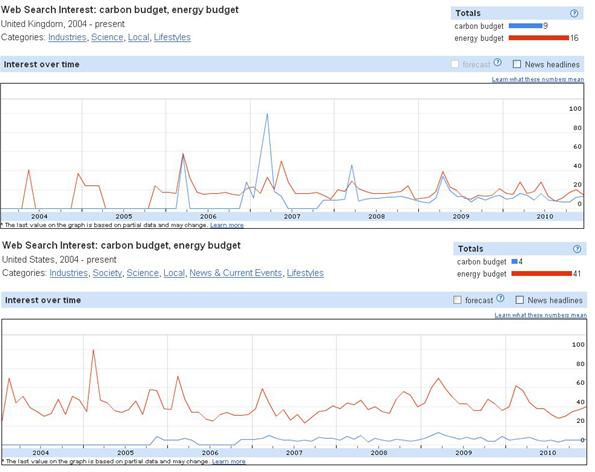 In the UK, Search volumes for “carbon”- and “energy”- “budget” behave like separate entities at first, but become more intertwined as time goes by. In the US, they remain distinctly separate. This tendency can be seen in many other comparisons of carbon/energy compounds, such as carbon/energy taxes and carbon-energy credits, not plotted here for reasons of space but easily verifiable by the reader using the tools made available by Google. Put together, results seem to confirm a growing concern for the “energy” aspect of climate change and a certain fatigue with the “carbon” component. 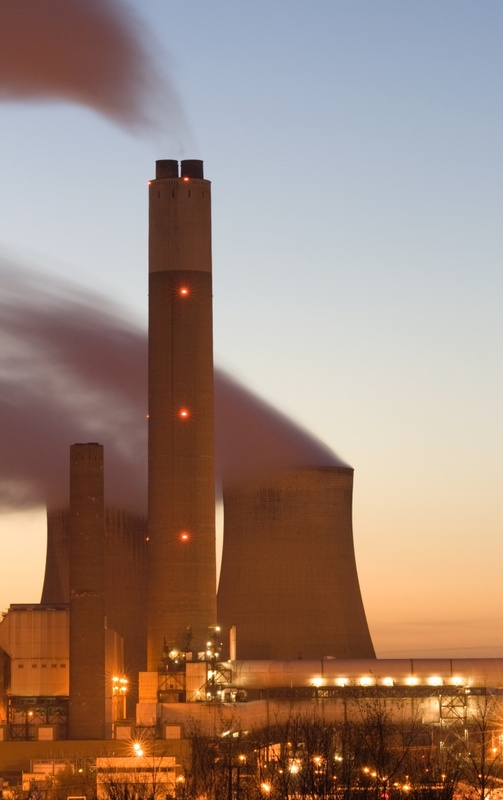 They also suggest that the British public is aware of the relationship between energy production and carbon emissions, while its American counterpart may not always see how the benefits of cheap energy and the costs of high carbon can be two sides of the same coin.